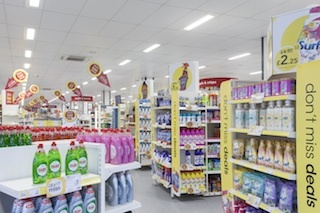 By delivering massive reductions in energy and maintenance costs, Zumtobel Group has confirmed one of its largest turnkey lighting solution, for homewares and household goods retail giant Wilko. 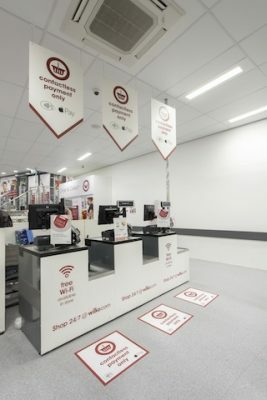 Following trials in two stores, Wilko’s independent energy calculations and site readings proved beyond a shadow of a doubt that Zumtobel Group could provide a lighting scheme that met all of the criteria for the company’s stringent requirements and strict environmental ethos, whilst delivering improved illumination levels using Thorn and Zumtobel luminaires. Wilko is one of the UK’s fastest growing high street retailers with over 380 stores that greet more than four million customers every week. Offering a wide range of household products, from housewares and garden furniture to stationery and batteries, the company started to rebrand as Wilko in 2013 to reflect their new mission of ‘where there’s a Wilko, there’s a way’. This enterprise is known for procuring vacant or decommissioned shops for new Wilko sites wherever possible instead of new builds, with the aim of creating a greener footprint. Sustainability and energy efficiency are high on their list of priorities, as is the aim of building a sustainable business culture which takes responsibility for its actions and supports a more sustainable solution for everyone they deal with and everything they touch. Zumtobel Group came up with a concept product specifically designed for use across the Wilko estate which, after discussion, became a CAD drawing and an engineering sample was constructed. With agreement over the luminaire, Zumtobel Group and Wilko expanded the proposal into a full turnkey lighting solution comprising lighting design, installation, extended warranty and maintenance, in a project that would become Zumtobel Groups’ largest single order worth over £22m. The project was broadened even further to encompass lighting the shop windows, entrance areas, back of house staff support areas, Wilko’s two distribution centres in Manton Woods and Magor and the company’s headquarters in Worksop. In fact, lighting for the whole Wilko estate will be provided by Zumtobel Group by the beginning of 2017 using in excess of 230,000 luminaires, 126,400 installation hours and not a single minute of retail down time. The existing surface mounted luminaires in front of house were removed, along with the necessary wiring alterations and have been replaced with Thorn’s 46 Watt recessed fittings, to create a uniform illumination with an average 800 LUX. Shop window illumination is provided by luminaires from Zumtobel’s Onico family, entrance areas are illuminated by high-performance CRAFT high-bay luminaires from Zumtobel and the storage areas are lit by the robust moisture-proof Thorn ForceLED luminaire. Emergency lighting is also included throughout the store and, where required, updated to meet current regulations using a variety of products from the range. Data loggers were installed in a selection of stores’ sales floors post and pre LED installation, with the purpose of obtaining real time figures. Unprecedented energy savings of up to 60% have been achieved on the sales floor rising to 70% when including back of house and savings in excess of 9802 Kw’s. Over 150,000 lighting products and controls have been used which will increase to 230,000 across the full estate, including the new stores, on completion. The project has been totally managed by Zumtobel Group, including the surveys, design, installation, commissioning and ongoing maintenance. Data loggers were installed in a selection of stores’ sales floors post and pre LED installation, with the purpose of obtaining real time figures. “Energy reduction is one of our environmental priorities within our Corporate Social Responsibility (CSR) strategy. That’s why we are investing in a LED lighting solution which saves up to 70 per cent energy. As a family business we recognize the long term effect of climate change and this investment will help contribute towards reducing our overall carbon emissions. We are pleased to have Zumtobel Group as our lighting partner. The new LED lighting will enhance the customer experience in store and require virtually no maintenance for several years. Zumtobel Group will provide an effective solution for all our stores so that we can focus on our core business helping people to achieve their ‘to dos’,” said Charlotte Whitmore, CSR Manager from Wilko. The broad product portfolio of the Zumtobel Group brands meant that the company could supply each area with the perfect luminaire for the task, which enabled Zumtobel Group to effectively project manage the whole scheme, right down to the supply of contractors. Zumtobel Group was responsible for the surveys, design, manufacture, deliver, installation, commissioning and maintenance across the whole project. An extended warranty for 7.5 years (parts and labour) was also provided by Zumtobel Group, in addition to assistance with putting finance in place. 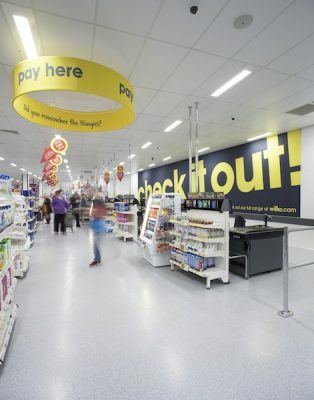 Moving to a recessed solution has reduced glare and enhanced the sales experience, in accordance with the company’s new brand image and there has been no disruption to trading as the refurbishment has been done outside stores opening hours.